If we need only a single column value from a related table to incorporate into a Microsoft Access Query then we can use a DLookup() function to bring that value into the Query Column. Normally we place that Table also into the Query's design surface, establish link between Primary Key of the main table and Foreign Key of the other table and place the required field into the query column. Here, we will examine an interesting solution to a small problem with a dlookup() function in a query column. The above method that normally we follow have some issues when implemented in the following situations, which we are going to explore. 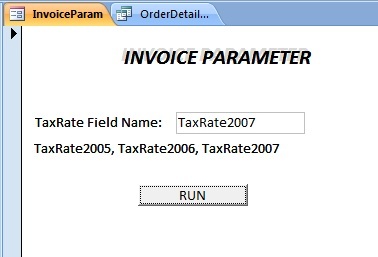 The Query Column name is TaxRate where the Dlookup() Function is inserted, irrespective of TaxRate2005 or TaxRate2006 or TaxRate2007 is selected in the function parameter like: TaxRate:Dlookup(“TaxRate2005”,”tblName”,”Criteria”). When we design a report we can use the report control name as TaxRate and no need to modify every time. Now, assume that there are Orders placed during December with the applicable Tax Rate at that time. There are Orders placed for materials immediately after the budget implementation with revised sale tax rate. We have to prepare some invoices with previous year sale tax rates and others with current year rates. That means the Dlookup() function will look like Dlookup(“TaxRate2005”,” “,” “) for previous year and Dlookup(“TaxRate2006”,” “, “ “) for current year. The table name and criteria part is omitted for clarity. As you can see the first parameter of the function must be changed every time for printing previous year and current year invoices. In the criteria part the ProdCode field of tblTaxRate table should match with the (Product Code) field of the Products Table linked with the Order Details Table to return the tax rate value for each item on the Order Details table.